Fill the house with the sweet aroma of freshly baked pound cake, an elegant treat that is as simple as adding a swirl of chocolate. Topped with a sprinkling of confectioners' sugar, a slice is welcome any time of the day. For best results, allow the butter and eggs to reach room temperature before beginning the mixing process. Preheat the oven to 350 degrees F (180 C). Coat a 9 x 5 x 3-inch loaf pan lightly with butter or with nonstick cooking spray; set aside. Cut the chocolate into small pieces with a sharp knife. Place in the top of a double boiler. As it melts, stir frequently with a wooden spoon or rubber spatula. Alternatively, to use a microwave, put the chocolate in a nonmetal bowl and use a low to medium power setting. Keep the cooking time brief, checking the chocolate every five seconds. It should look glossy and become lighter in color but still retain the shape it had before melting. Stir to liquefy. Once the chocolate is melted, let it cool to room temperature. As the chocolate cools, sift together the flour and baking powder. Cream together the butter, sugar and salt on medium speed with the paddle attachment, scraping down the bowl as needed. Continue to cream the mixture until it is smooth and light in color, about 5 minutes. Begin to add the eggs gradually in three additions, beating them into the batter thoroughly and scraping down the bowl between additions. (If the eggs are not at room temperature when added to the creamed mixture, the batter may appear curdled. If this should happen, continue to mix, without adding more eggs, until the mixture looks completely smooth again.) Continue adding the remaining eggs. Add the sifted dry ingredients, mixing on low speed until just blended and scraping down the bowl as needed. Transfer one-third of the batter to a separate bowl and add the melted chocolate, folding it in thoroughly with a rubber spatula. Gently pour the chocolate batter into the plain batter. Using the handle of a wooden spoon, gently swirl the batters together with 3 to 4 strokes. Do not overblend. Pour the batter into the prepared loaf pan and place in the oven. Bake until a toothpick inserted into the middle of the cake comes out clean, about 50 minutes. Cool the cake in the pan for a few minutes, and then transfer to a cooling rack to cool completely. Once cooled, sprinkle with confectioners' sugar, slice and serve. Makes 1 (2 pound loaf), 12 servings. cake is on the dry side. 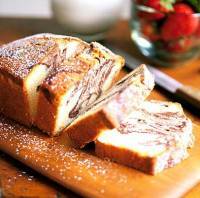 I like Marble Pound Cake !!! This is the first cake i've ever baked, and it turned out awesome. Everyone loved it. Thanks Diana. I love pound cakes, so everytime I have a chance I try a new recipe, this one is great.